I remember when I wanted to make director at a bulge bracket investment bank by 30. Such an obnoxious brat! I was told that by someone who is still my friend, 10 years my senior and quite the obnoxious brat himself. He was right and I don’t take it back or shy away from that being the thing in my head. You think it is all so easy, just work hard enough, right? You think it’s all going to be worth it. Both of those things are wrong and did I make my goal? No. Was it worth it? Not really. Was failing worth it? Absolutely! Of course, I didn’t recognize the reasons for that failure until well after the fact, but that is a different story. There were multiple factors involved, not just my behavior, but that of others which, depending on your point of view, may have been specious and unworthy, but not necessarily wrong. Or completely wrong. The simple truth is that what happened, happened, and you can only move on from it. I could only move on from it. I was officially derailed from that goal at 27, but I still tried to find another way around it, and that led me to try different things, take different risks, and start to broaden my perspective of the world. I picked my head up, out of the keyboard and out of the status-seeking, and I looked around. Did you know that some people take jobs and don’t have careers? I didn’t. Did you know that some people don’t want to get promoted? I didn’t. Did you know that some people don’t base the majority of their identities around their jobs? Nope, that was news to me. Did you know that some people are just trying to hold on to put their kids through college, to make it to retirement, or to just cap off a particular amount in their savings so they can quit and travel the world? I had no idea! I have a former colleague who has been ready to retire for years, but just wants to make sure the last kid starts college – doesn’t need to finish, just start. I know someone who stayed long enough in finance to pay off his college loans and quit to become a police officer. And story after story after story… and suddenly, there was this whole, big world, full of colors and variety and something more than just having a career. When did we, particularly here in the US, but in most of the Western world, start worshipping the god of the office? When did we start eschewing all of other possible identities: kids soccer coach, weekend musician, or amateur numismatic? I have a music blog that I rarely update and when I told a friend that I was planning to focus on it more, his first question was: “Are you going to get subscribers and charge them? Or ads?” And I looked at him like he had lost his mind; it was just a hobby, a thing to amuse me, I didn’t need it as a source of income or another job! You’re not doing enough. You, as you are, are just not enough. A thing I never quite figured out what it was because I started grinding my teeth at night, I broke part of a tooth, and spent almost a year trying to get it fixed in an absurd set of dental appointments that forced me to relax because what else do you do in a dentist’s chair but relax and hear your dentist’s stories about his ice hockey days and getting his son sorted out for college while the oldies station plays in the background? One day, if you are fortunate, you wake up and ask yourself why and what is it worth and what does it get you? Money, sure, that’s nice, and anyone who tells you money doesn’t have some cushiness to it, is lying. When you get a promotion, do your friends raise a few glasses and give you lots of likes on Facebook? Sure! That happens, too, and there is nothing wrong with that. But in this march to make a career, to become a leader, to mount all of those awards and trophies on the wall, to get all the certificates, did you actually ever become enough? Or is it more like a treadmill that every 10 seconds the speed keeps upping by one decimal place, and 10 seconds and up, and 10 seconds and up, and you keep running faster and faster and faster until you can’t. Then you fall off. You fall down. 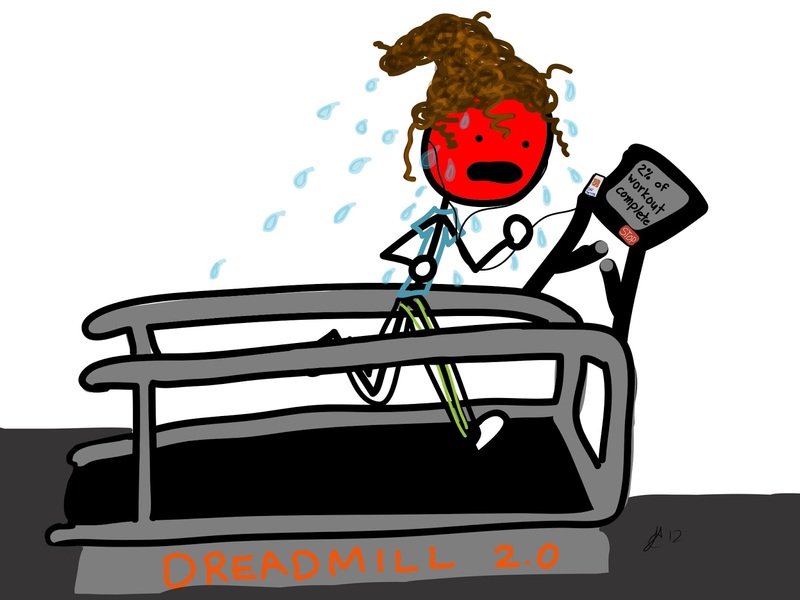 There is nothing worse than falling off a treadmill at full speed; it is ugly, ungainly, you probably break something, there are skid marks on your face, it’s brutal. Why is the message being pushed at us to keep running on those treadmills? We first get on them in high school or if you live in an area like the Upper East Side of Manhattan or Park Slope in Brooklyn – or any upper-middle/upper class city enclave in this country – it starts at pre-school. Your kids are 3 years old – why are they on treadmills?! We are the most in-debt, obese, addicted, and medicated adult cohort in U.S. history. I could be wrong, but I think I’m right when I can say that sentence extends to our entire society, young, middle-aged, and old. We work really hard… and then we spend a lot of money on soothing ourselves with food or alcohol or both and/or all sorts of other substances. I know folks who start their day, every day, with a can of Red Bull and then a large cup of coffee instead of attempting to get more or better sleep the night before. They tongue their uppers and drink their downers as these are the bookends of their day because they need to work, to work more, to stay on that treadmill, to keep going faster, and they can’t stop because they have lost all control of the speed. Well, you could do what I did at one point: just fall off. The breaking of a tooth? Definitely a fall. And then after, you could also keep doing what I did: stay off. Take a break. In finance, they tell people: “If you give up your seat, someone will be there to occupy it the next day.” That is the bogeyman that sits on your shoulder and keeps you working. Is that a lie? Nope! You quit, less than a month or two later, especially if you’re in a profit-making position, someone will be in your seat, using your monitor, and spilling their coffee on your keyboard. So what? Let them! At first, if you step off and take a break, you may still wake up in the middle of the night thinking that someone texted you and it’s urgent and you need to answer it. Then, you’ll go a little mad with the freedom and joy and the sunlight that you’re taking in. Is living the life that suits their needs and their purpose. Now, there are people who are driven to be leaders and their career is the most important thing for them, and it makes them happy. Applaud those people! Because work really is their thing, it is just who they are and that is fine! But for the rest of you, ask yourself, every 10 seconds, is it getting faster, do you want to run faster, what are you getting out of it? Well, if you have no good answers to that question, you may need to give it a little think. Who knows? You may pick your head up, look around, and discover there is something else out there for you. Cover Image: “Run Sweaty” by Julie Erdman.